Parrots are striking, beautiful, impressive and entertaining pets to have. They make wonderful companions. Their colorful patterns and cute mannerisms, including picking things up with their feet and climbing with their bills, endears them to us all. Parrots have a pan-tropical distribution with several species inhabiting the temperate Southern Hemisphere as well. The greatest diversity of parrots is found in South America and Australasia. Parrots are known for their colorful plumage, sharp beaks and wide wingspan. The most obvious physical characteristic of parrots is their strong, curved, broad bill. The upper mandible is prominent, curves downward, and comes to a point. It is not fused to the skull, which allows it to move independently, and contributes to the tremendous biting pressure these birds are able to exert. The lower mandible is shorter, with a sharp, upward facing cutting edge, which moves against the flat portion of the upper mandible in an anvil-like fashion. Every African Grey Parrot is as different from the other as i am from you. The African Grey Parrot is a notorious feather plucker. The Amazon Parrots were first brought to our land by Christopher Columbus. The Amazon Parrots are very energetic, playful and social creatures that crave lot of interaction with their human owners. Eclectus Parrots are such intelligent creatures that sometimes they train themselves after only one incident of you showing displeasure at being pooped upon. Among all birds in the entire parrot family, Eclectus Parrots rival only the African Grey and the Amazon in their clarity of speech and scope of vocabulary. Quaker Parrots require a tremendous amount of attention and stimulus in order to avoid boredom and aggression. The more you respond to the noises made by your Quaker Parrots, the more you invite them to acquire human speech. The Senegal Parrots learn to talk and imitate sounds such as the creak of the garage door and the ring of the telephone. Like all birds the Senegal Parrots must be allowed time out of the cage to exercise and interact with you. Among all birds man has tamed the green parrots seem to be the most favorite. Green Parrots are intelligent, affectionate, inquisitive and can be easily trained. The smallest parrot is probably the Buff-faced Pygmy Parrot from Papua New Guinea. The largest is the Hyacinth Macaw from S. America. Lories and Lorikeets, Cockatoos and Cockatiel, Macaws, Lovebirds, Conures, Short-tailed Parakeets, Amazons and Senegal are some examples of the different kinds of parrots that beautify our earth. Parrots are popular as pets due to their beauty, intelligence, and sociable natures. Many Psittacines can imitate human speech or other sounds. Parrots can make excellent companion animals, and can form close, affectionate bonds with their owners. Parrots that are bred for pets may be handfed or otherwise accustomed to interacting with people from a young age to help ensure they will be tame and trusting. These birds are not low maintenance pets; they require feeding, grooming, veterinary care, training, environmental enrichment through the provision of toys, exercise, and social interaction (with other parrots or humans) for good health. Parrots are intelligent animals who depend on some degree of socialization and will not be good pets unless they are taught and patterned to be good pets. Good training is therefore vital to make these parrots bond with you. The popularity, longevity, and intelligence of many of the larger pet parrots has led to many of these birds being re-homed during the course of their long lifespan. A common problem is that large parrot species which are cuddly and gentle as juveniles will mature into complex, often demanding adults that can outlive their owners. Due to these problems, and the fact that homeless parrots are not euthanized like dogs and cats, parrot adoption centers and sanctuaries are becoming more common. Popular as pets due to their sociable and affectionate nature, high intelligence, bright colors and ability to imitate human voices, parrots have historically been kept captive in many cultures. Pet parrots may be kept in a cage or aviary; though generally, tame parrots should be allowed out regularly on a stand or gym. 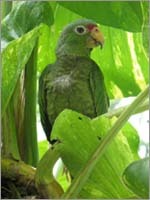 Depending on locality, parrots may be either wild caught or be captive bred, though in most areas without native parrots, pet parrots are captive bred. Pet parrots can be trained to talk and perform amazing tricks. However, it is not easy to train pet parrots. They are intelligent, graceful and often moody birds. Having kept pet parrots for over twenty years now, I know how difficult it is for all you new pet parrots owners. After all these years of extensive research, I can readily recommend two very useful resources that will train your pet parrots perfectly. The cage shape is also very important for the bird. Square or rectangular cages are more appropriate for parrots. Before buying the cage, do a thorough checking of the security mechanism. Parrots are active and playful birds, who need a spacious cage to clamber around in. Remember these cages needs to have perches, toys, feeding bowls, water bowls and rest areas. Choose your Parrot's cage based on the size of your Parrot. Parrots feed on a variety of shapes, colors, textures, and sizes of natural foods. Quality proteins, Vitamin A rich veggies, wholegrain and carbohydrates are absolute yummies with parrots. Many even prefer boiled vegetables to fresh ones. Give plenty of fresh water to your Parrot for a happy and healthy bird. Beware, that a Parrot can become bored with formulated diet that can trigger off negative behavior. Make a combination of small parrot mix and supplement with your bird's regular meals. Vitamin supplements can be added to their drinking water or sprinkled on their food. Make sure you never feed your bird avocado, cabbage, parsley and iceberg lettuce. Remember, your pet's diet will improve its health and will keep it content. Care should be taken while trimming your bird's feathers. How To Keep Your Parrot Healthy?